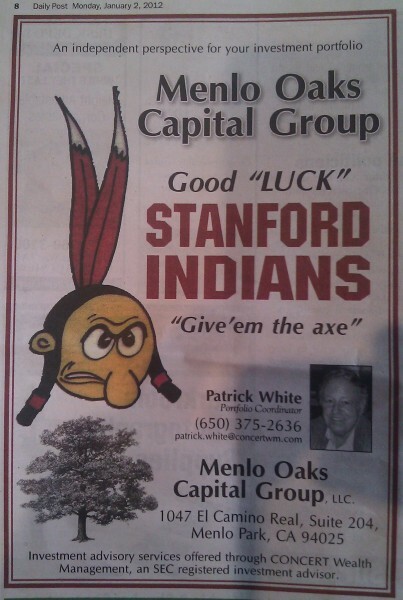 Good "LUCK" Stanford Indians "Give 'm the axe"
It is good to cheer on your sports team, but I suspect that if the sports team mascot when you were growing up had been a buck-toothed, squint-eyed Chinaman in a big peasant hat, that you might think twice about printing a Chinaman cartoon in the newspaper. If you were to have such respect for Chinese people and culture, perhaps Indians merit the same sort of respect. When I was younger my school had an Indian Chief for a mascot. The dozens of our Native American students found it upsetting and it took a few decades of protesting before it was finally removed. While one side found it upsetting that their culture was caricatured to cheer on a sports team, fans of The Chief took offense that Liberal Elites wanted to destroy their culture by imposing Political Correctness on their Hallowed Tradition. So, you had folks insisting that they had to insult another culture in order to properly honor their own culture. Anyway, some years after I graduated, The Chief got to retire. Alumni kept contributing money and people kept cheering on their team as they had before. Nothing positive was lost, and our school has since regained some respect it had lost during its years of overt racism. You can make fun of me and rationalize printing racially offensive cartoons in the newspaper all you like, but somewhere deep down, you know it is not right, and you know that you are offending people and scaring away potential clients. Most people are too polite to raise a fuss. But this topic means something to me, so I thought I’d drop you a line and encourage you to think things through. I don’t need to change Pat White’s mind, and I surely don’t need him to manage my wealth. On the whole, the world seems to be taking a step or two forward for each step back. But it sure is weird to see a racist cartoon published in a newspaper is 2012, 40 years after Stanford managed to figure out that American Indians deserve a little more respect. 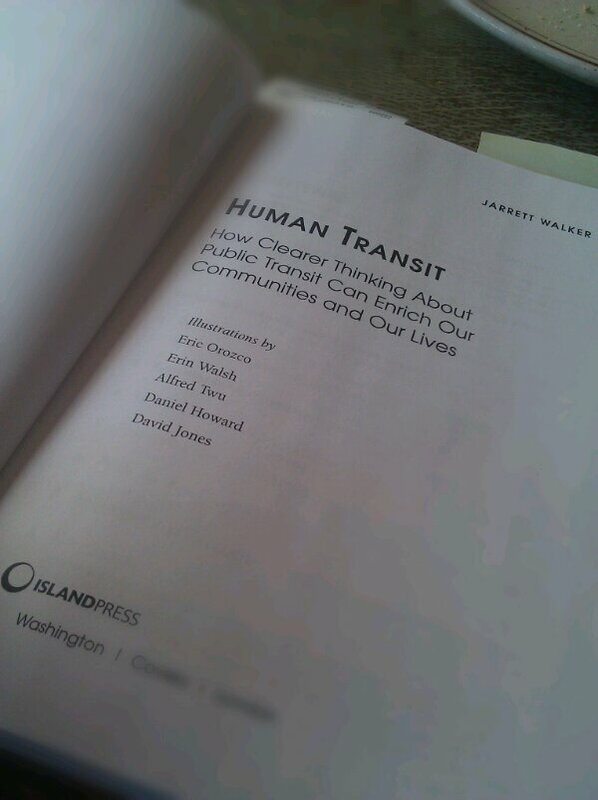 Cracking open a copy of “Human Transit” which I helped to illustrate! A Yamamoto delivery van in San Jose. I love these guys because the logo is a mama cat carrying a baby cat. 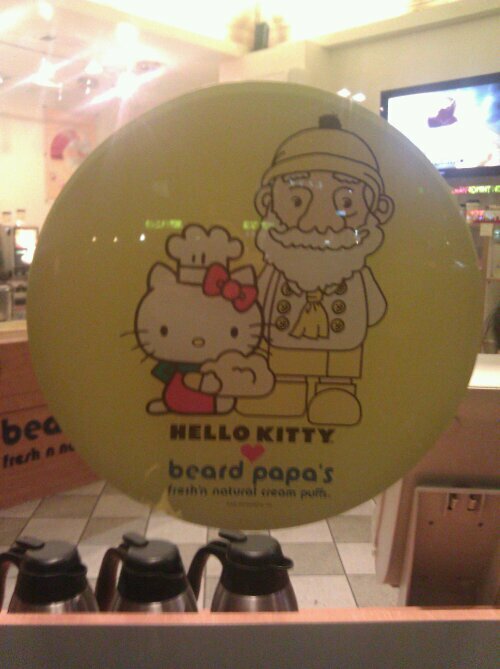 Hello Kitty ♥s Beard Papa’s. 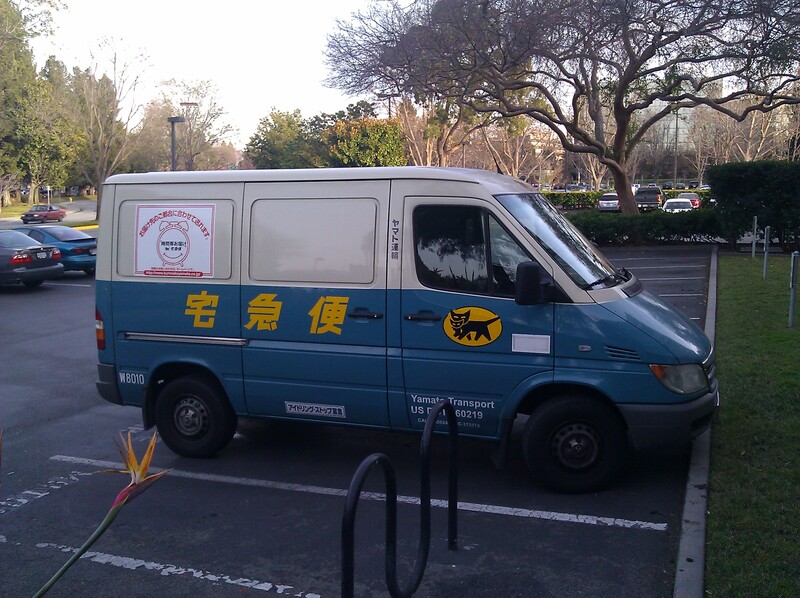 As seen in Cupertino, CA. Yesterday I got Dr Sick Wife to drop me off at the Santa Clara Convention Center so Mr Sicker Light-Headed Husband wouldn’t miss any PYCON. After an awkward twenty minutes of asking people there for the lighting and LED conference where the Python was, I checked my smart phone and noted that … PYCON is *MARCH* 7th. So I took the light rail home and told $BOSS I was on PTO (well, I call it MLK day due to Puppet Training) I then slept a lot, and did other things sick people do that don’t bear repeating in a professional context, and watched Dr Who save the Earth on TV, slept some more, and I am feeling way better today, which means I feel regular sick, not super sick. 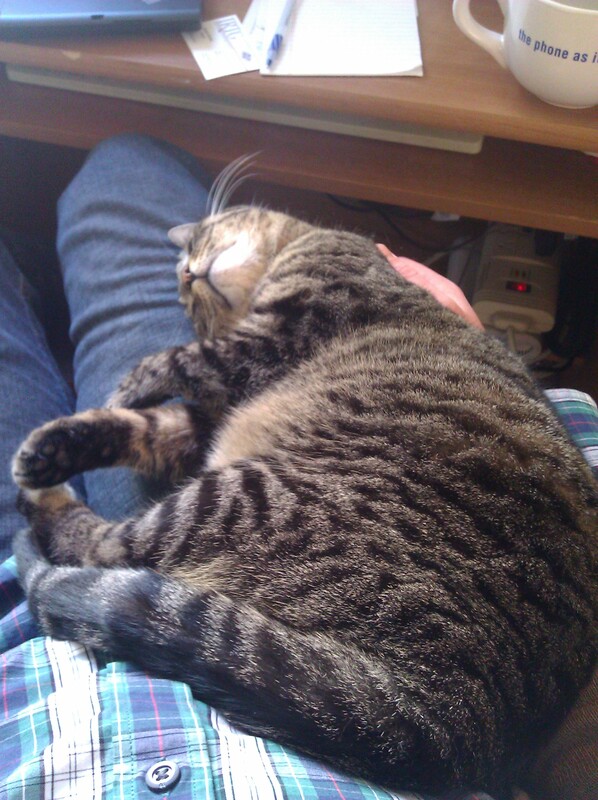 So, I’ll be WFH today. Trust me, whatever this is, you’re lucky to miss out! I don’t normally get sick so this is a novel experience … I’ll likely be seen in the office next week, though if I’m coughy or sneezy I’ll keep that train wreck at home, because, as you might gather, you don’t want a piece of this! If you’re attending PyCon, I look forward to seeing you there … next month! Hopefully I won’t be light-headed! 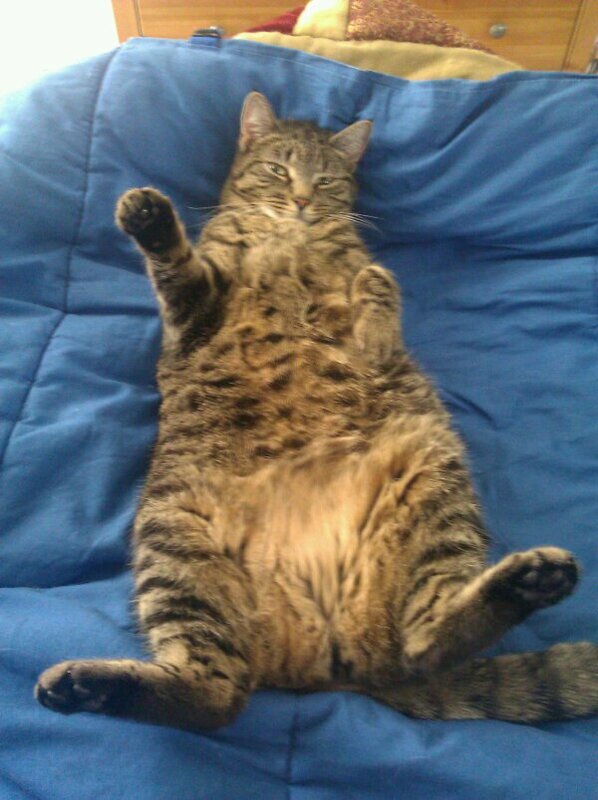 On days I Work From Home, Maggie enforces her mandated 3pm Pet-the-Cat break.
. . . inviting food . . . 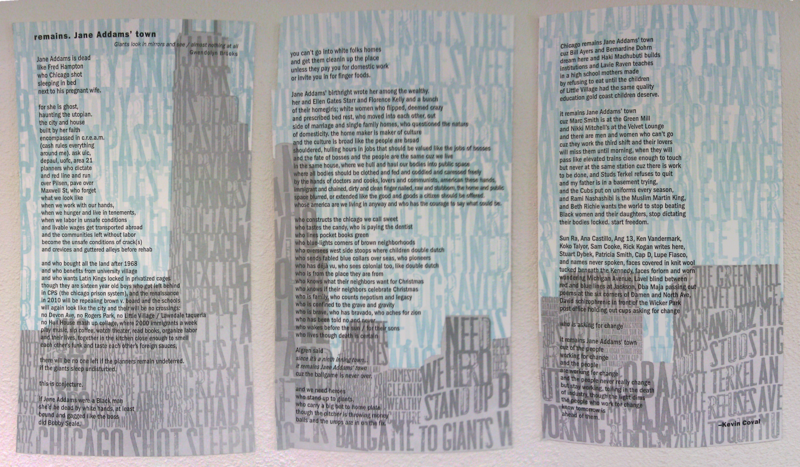 This triptych of a poem caught my eye from across a classroom at De Anza college in Cupertino. Break time during a class at De Anza College, I wander across the room. 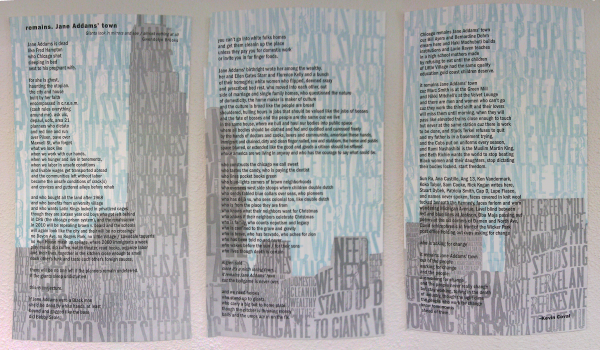 The skyline . . . that’s John Hancock. I start to read . . . words written by Kevin Coval. My home town, Chicago, the city of broad shoulders and ambition, is where the wealthy have pushed the workers and the workers have pushed back. Jane Addams, as my memory serves, founded the Hull House back in the 19th century, to look after the needs of working people: meals, health care, education, general community services. At a time when class divisions were sharper than they are getting to be today, Jane Addams bucked the conventions of her time to push for the American ideal: that we all, regardless of class or wealth, merit a helping hand, a warm place to sleep, and nourishment for our bodies and our minds. Growing up in Chicago, getting educated in the Chicago Public Schools, the sense of perpetual struggle for a better, more equitable future, I think it gets in to your blood. People come looking for a better life, and they find that sometimes they have to push a bit to realize that better life, if not for themselves then at least to give their children a shot. We’re all passing through those gates, at our respective levels of society, and the struggle never dies and the struggle must never be forgotten. Now I live in the Silicon Valley, where people struggle and strive, and while the ultimate aim is to make the world more comfortable and efficient, the focus is pretty far removed from the front lines of class warfare. Even so, I ride the train every day past miles of walled mobile home parks, and I wonder if there’s more going on beneath the surface than us privileged IT folk know. Arguing over the margins, in the grand scheme of things, describes my day job. balls and the umps are in on the fix. I’m no hero and my bat is nothing to brag about, but I relish those occasions when I do get to step up to the bat and swing, however ineffectually, at a ball I’m not allowed to hit. Its the Chicago in me. I owe more. 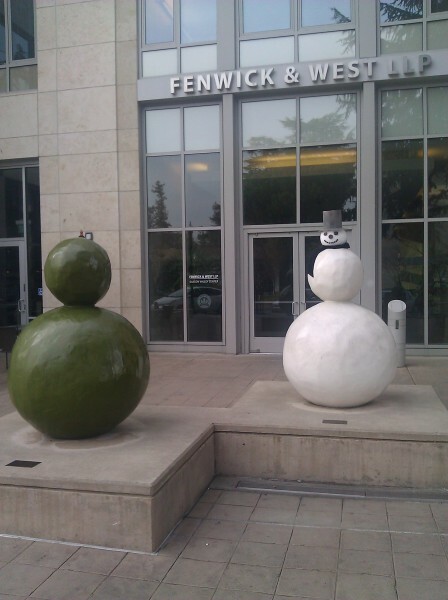 Taken Jan 2, 2012, this is as close to a snowman as you’ll ever get in Mountain View, CA. 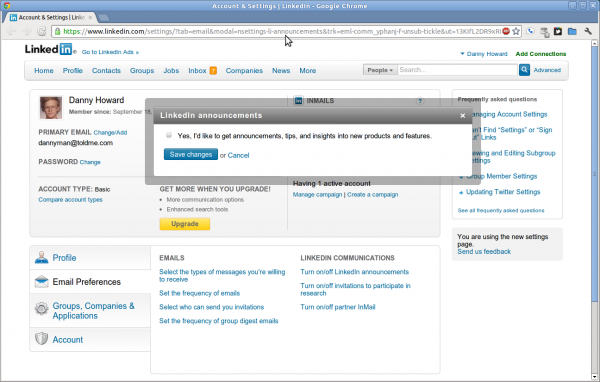 Not only is this not an unsubscribe feature, LinkedIn gets bonus points for trying to sign you up for MORE e-mail. Instead of screwing around with the half-dozen sub-menus again, I dropped them a feedback saying that this burns up good will, damages the brand, discourages me from engaging, and may in time lead me to delete my profile. There’s more than one way to search for resumes online. 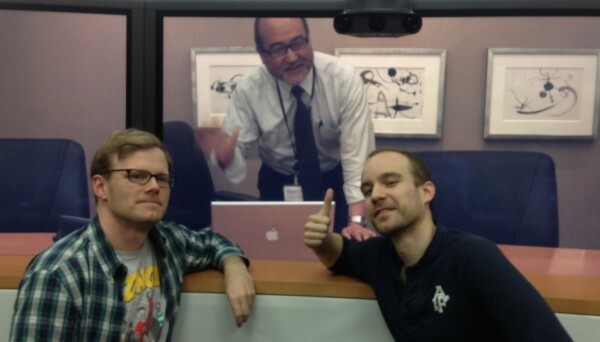 Our Frenchman flew over to San Jose from London, and wanted a picture with our American colleague in Tokyo. 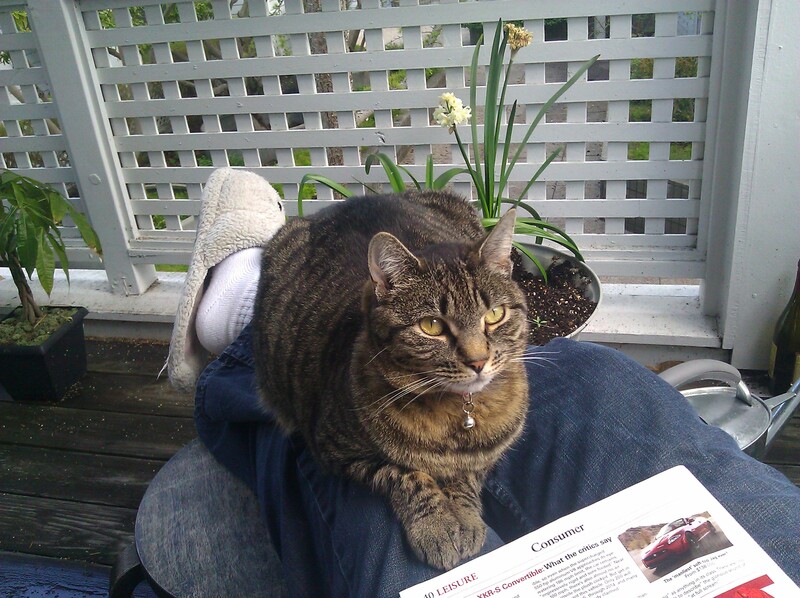 Most of the time, Maggie isn’t big on laps, but today my legs offer a warm dry spot to enjoy a sunny break from the wet weather. Above all science was becoming religion; psychology was reducing metaphysics to experiment and a sociology of human action was planned. Fighting the vast concept of evolution, religion went into its heresy trials, its struggle with “higher criticism,” its discomfort at the “revised version” of the New Testament which was published the year I entered college. Wealth was God. Everywhere men sought wealth and especially in America there was extravagant living; everywhere the poor planned to be rich and the rich planned to be richer; everywhere wider, bigger, higher, better things were set down as inevitable. I feel my heart and mind whipsawing between a world culture which is on the cusp of some fundamental, unimaginable change, and a world in which we will pretty much keep doing what we have done, just bigger, bolder, better, faster, with nanites and a higher rate of return . . . I get dizzy thinking about this world I try to live in. And Religionists and Conservatives keep shouting their objections to a changing world ever louder, ever more viciously. They’re still attacking Evolution, so the concept and theological implications of Anthropogenic Climate Disruption are even more of a leap . . . But it is the Big Things you don’t hear in the news every day; When will climate change trigger famine and mass migration? Will China’s rise be sustained to the point it becomes a world power or will it implode? When are we going to be hit by that asteroid that superheats the atmosphere? Just after the devastating global pandemic that trained against antibiotics and traveled everywhere on jet planes before we noticed it? Will nanofabrication make industry and perhaps agriculture obsolete? Will the Singularity bring upon us a supra-individualist world consciousness? Will medical science and DNA repeal the eternal inevitabilities of aging and death? Is that when we will feel comfortable encapsulating our bodies on centuries-long trips to distant star systems? The new Magellans will refer to centuries as we refer to decades. My thinking is so early 21st . . . These are the things I tend to wonder about between meetings at work. Remember pets.com? Back in the Dot Com Bubble, they had this awesome business plan to sell pet food … using the Internet! They had a Superbowl commercial, than they died like so many other startups when the Dot Com Bubble imploded on itself. Yes! Peer-to-peer vacation homes! For pets! Yes! A billion dollars for an iPhone app that takes pictures that look like Polaroids. But you don’t just get the app, you get the iPhone users who have been uploading their photos to social networking sites, because that is a key demographic that Facebook has yet to crack! We are the supermen . . . I am reading a book by W.E.B. 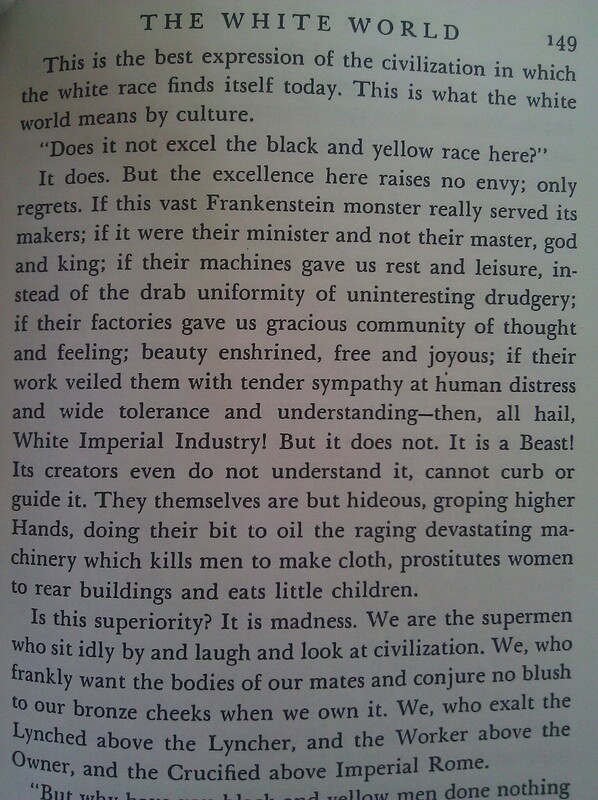 Du Bois, based on this quote which was captured in a photo of New York graffiti.